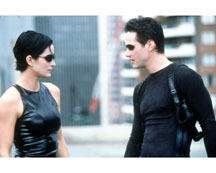 A mint color shot from the hit sci fi film THE MATRIX starring Keanu Reeves, Carrie-Anne Moss and Laurence Fishburne. Prints are glossy 8x10 on premium Kodak paper. Item #4.